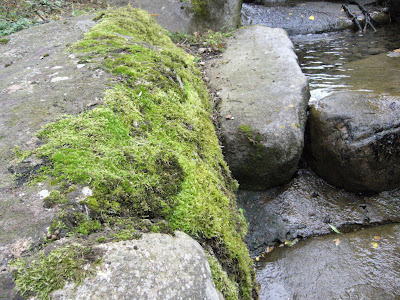 Ptyxis Ecology - Our Botany Blog: A mountain stream in Regent's Park?? A mountain stream in Regent's Park?? The shot below shows a water feature in the 'nature study' area of Regent's Park in central London. On a recent bryophyte survey we did for the park this was one of the few habitats we found with a well-developed bryophyte community. The sheltered water feature creates a suitable humid environment for several species that otherwise occur only sparsely in the area. However the biggest surprise was finding Racomitrium aciculare sitting on rocks by the 'stream'. This species has never been recorded in Middlesex before and is very uncommon in south and east England as you can see from this distribution map from the NBN website. In the north and west of Britain you can almost gaurantee to find it on rocks by any upland stream, but this habitat is absent from most of lowland Britain. The neat round cushions with the white hairs sticking up in the picture above are Grimmia pulvinata which is a very common species on rocks and walls everywhere. Racomitrium aciculare is the more straggly dark green plant in the middle of the top of the picture, with a few more shoots on the top right. 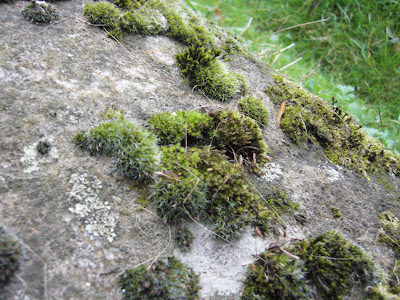 The main focus of the survey was to look for bryophyte epiphytes (plants that grow on trees). These were fairly sparse and mainly confined to a small number of species. Many epiphytic species cannot live in areas with high athmospheric pollution. In recent decades particulate air pollution associated with coal fires has almost gone and as a result in recent years several epiphytic species have been sucessfully recolonising areas they have been missing from for a very long time. However most truly urban areas still have relatively few epiphytes. The picture above shows the most common type of epiphyte community we found, comprised mainly of the lichens Physcia adscendens and Xanthoria parietina, with a little of the moss Orthotrichum diaphanum. Most Orthotrichum species are epiphytes and Orthotrichum diaphanum is the one that is most tolerant of air pollution. On a small number of trees the bryophyte element of the epiphytic community was more developed but it usually consited of just Orthotrichum diaphanum and Rhynchostegium confertum. Interestingly, their were occasional cushions of both Tortula muralis and Grimmia pulvinata on the trees. These species normally grow on walls or rocks and only rarely grow on trees, but something about the tree habitat in London makes them behave differently. There are many London plane trees in London parks and at first glance these would seem to be unpromising habitat for epiphytic species as the trees shed their outer bark in small patches very regularly. 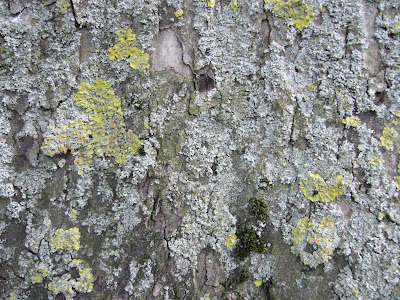 This habit allows the trees to cope with polluted areas better than most other tree species as every time the bark is shed it results in a fresh clean new bark free from grime, helping the tree to breathe easier. It turned out that London plane is in fact the best tree species for bryophytes in central London (apart from elms which are much less common). The epiphyte community is often fairly well developed on the base of the larger trees where the bark is no longer shed so regularly. 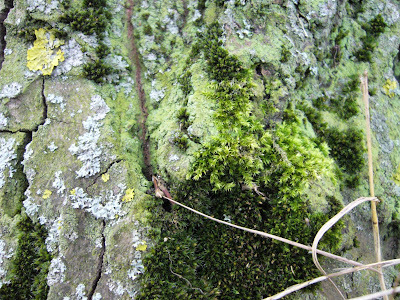 The texture and chemistry of the bark must make the suface more suitable for epiphytes than the other tree species.